The 55-foot-tall (17-meter) Electron rocket, propelled by nine kerosene-fueled engines, lifted off Thursday from Rocket Lab’s space base on the tip of Mahia Peninsula, a rocky outcrop on the east cost of New Zealand’s North Island. Peter Beck, founder and CEO of Rocket Lab, told reporters after Thursday’s launch that engineers were analyzing data to determine what went wrong to prevent the Electron from entering orbit. Nevertheless, Beck said Rocket Lab’s team was “ecstatic” following the test flight, which he said proceeded normally until some time after ignition of the second stage’s single engine. 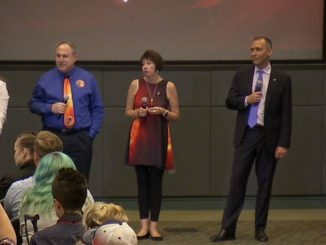 “We had a really good lift off from the tower, a good first stage burn, we went through Max-Q, which is the area where the rocket experiences the maximum structural loads,” Beck said. “We had a good first stage burn, we got a good stage separation, a good second stage ignition, and we got all through the fairing separation. “We’re really happy with what we achieved … For a test flight, we got a lot further than certainly we expected, and we captured all of the major events through the flight,” Beck said. The Electron rocket is designed to deliver small satellites and clusters of CubeSats into orbit at relatively low cost. According to Rocket Lab, the launcher can carry up to 330 pounds (150 kilograms) of payloads to a 310-mile-high (500-kilometer) sun-synchronous polar orbit, a perch preferred by many Earth-imaging spacecraft. And Rocket Lab says it can do it for $4.9 million per launch, significantly less than prices of other rockets. Buoyed by $148 million in venture capital financing and investments from Lockheed Martin and the government of New Zealand, Rocket Lab announced the Electron program in 2014 after launching more than 80 suborbital sounding rockets since the company’s founding in 2006. Beck said Rocket Lab’s focus now is on analyzing data collected on Thursday’s test launch, which did not have a commercial payload on-board but aimed for Earth orbit. The second of the company’s three planned Electron test flights is expected later this year. Headquartered in Southern California with a factory, mission control center and launch base in New Zealand, Rocket Lab is one of several companies vying in the small satellite launch market. Virgin Orbit, a spinoff of the space tourism developer Virgin Galactic, is working on the air-dropped LauncherOne project at a factory in Long Beach, California, with a test flight scheduled as soon as the end of this year. Another company, Vector, also has plans for a satellite satellite booster, but it is further behind Rocket Lab and Virgin Orbit. Speaking to reporters in a conference call, Beck did not offer any speculation on the anomaly that brought down the Electron rocket Thursday. Rocket Lab has launch contracts to deliver CubeSats to orbit for NASA, Planet and Spire Global, plus a rideshare launch agreement with Spaceflight, a Seattle-based company that aggregates batches of small satellites to fly on the same rocket. 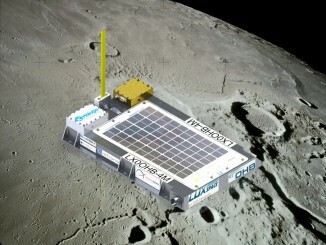 Moon Express, a contender for the Google Lunar X-Prize, also plans three launches of tiny robotic moon landers on Electron rockets. After blastoff from Launch Complex 1 at Mahia Peninsula, the Electron turned south over the Pacific Ocean, climbed through a deck clouds and achieved supersonic speeds within about a minute. Nine Rutherford engines, developed by Rocket Lab, powered the booster into the sky on more than 40,000 pounds of thrust, around half the thrust generated by an engine on a Boeing 777 airliner. The Rutherford engines, one of which also powers the Electron upper stage, use battery-powered pumps to cycle liquid propellants, an innovation Rocket Lab describes as “entirely new” in rocket propulsion. The Electron’s engine, named for the New Zealand-born nuclear physicist Ernest Rutherford, is the first of its type to be primarily 3D-printed. Each Rutherford engine, including its engine chamber, injector, pumps and main propellant valves, can be printed in 24 hours. “Everything we saw in the first stage looked nominal, but we’ll have to go and review the data,” Beck said. Although the Electron fell short of the speed it needed to enter orbit, Beck said it was not a setback. “We got through all the critical events of an orbital flight, right through past fairing separation, so that puts us in a very, very strong position for the next test flight,” Beck said. “Bearing in mind that it’s very rare that a new launch vehicle, especially one from a new start-up company, would reach orbit, we’re very happy with the data that we’ve seen and how far we got on the first test flight. Beck added that Rocket Lab intends to reach orbit on the second test flight, and the outcome of Thursday’s mission gives the team more confidence. Rocket Lab shipped the first Electron rocket to its launch base in February, and teams spent the last few months commissioning and testing ground systems needed to pump propellants into the launcher, track the rocket’s flight, and destroy the booster if it strayed off-course. 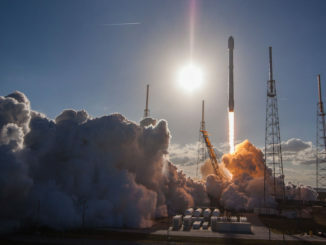 The company said the launch facility on Mahia Peninsula is the first fully commercial privately-operated orbital-class launch range in the world. The Federal Aviation Administration has regulatory authority over Rocket Lab’s launch operations because it is a U.S.-based company with intentions to eventually launch from sites in Alaska and Florida. New Zealand aeronautical and maritime agencies were responsible for clearing air and marine traffic for the launch. Crews from the Pacific Spaceport Complex at Kodiak Island, Alaska, traveled to New Zealand to set up range safety systems for Rocket Lab. Poor weather kept the Electron grounded on three consecutive days before Thursday’s liftoff, giving Rocket Lab’s launch team extra practice on countdown and scrub procedures. Now attention turns to tune the next Electron rocket to fix the problem that plagued last week’s test flight. Rocket Lab did not provide a live public video feed of Thursday’s launch, but Beck said the company will “probably” set up a live webcast for the next test flight.